DETROIT, Jan. 9, 2017 /PRNewswire/ -- Adient (NYSE:ADNT), the world's largest global automotive seating supplier, today unveiled its innovative AI17 automated driving seating system to show how automated driving will impact the driver and passenger experience in a contemporary premium vehicle at the North American International Auto Show (NAIAS) in Detroit. The interior of automated driving vehicles will play an important role as drivers and passengers spend more time on non-driving activities. Once vehicles have the capability to be computer-driven, occupants will demand far more flexibility from a vehicle's seating and interior space than ever before. "Our AI17 demonstrator shows how we are embracing the opportunities for innovation afforded by automated-driving vehicle technology," said Bruce McDonald, chairman and chief executive officer of Adient. "The concept features innovations that increase interior flexibility, while also providing occupants with higher levels of safety, comfort and convenience." Adient, created when Johnson Controls' automotive seating business was spun off as an independent company in 2016 and is sharing several concepts and production ready products at this year's NAIAS. According to Richard Chung, Adient's vice president of innovation, the AI17 showcases innovative solutions for level-3 and level-4 autonomous vehicles that forecast how enjoyable future interiors will be. "Based on extensive market and consumer research, the products in the demonstrator have been carefully designed with a modular approach to accommodate a wide range of vehicles and enable differentiation by segment," said Chung. Greeting/Conversation Mode — A rotational base platform that swivels, allowing front-seat occupants to move freely. The base lays the foundation for greeting and conversation modes. For greeting mode, the base rotates up to 70 degrees outward so occupants can easily get in and out of the vehicle seat. The seats also rotate 15 degrees inward providing an intimate setting for interaction during automated driving scenarios. Synchronized power movements of the seat optimize the position of each occupant for all modes. Integrated electronics remember favored positions. Front-seat — Designers embraced safety, comfort and convenience. At the center of the concept is an anthropometric pivot that ensures the seat reclines with the occupant's body and is supported even as it reclines beyond the traditional range. Related components - head restraint, dual-sided armrests, leg rests - are synchronized to move with the body and are designed to support a contemporary premium experience. Adient's patented "Comfort Shell" seating technology offers a lightweight, flexible panel that conforms to the body along the spine and supports the lumbar. Rear-seat hybrid structure — The cantilevered rear-seat hybrid structure optimizes comfort for rear-seat passengers, regardless of how they spend their ride time. The seating system reveals more personal space, provides up to 45 degrees of reclining comfort and an integrated leg rest that stows underneath. Rear-seat stowage — To carry larger cargo, rear seat cushions and frames stow to a thin stadium position to create extra space. Rear-seat leg rests — Integrated leg rests for the rear seats are made of spring steel and flex when pressure is applied from the passenger's calf, stowing underneath the cushion to create a better packaging space. Cushion Console — The AI17's "Cushion Console" concept offers a seamless front console that extends into the rear passenger space, providing an armrest that supports the entire arm and a space to store smaller items. Armrests — The dual-sided, front-seat armrests provide support for resting, sleeping and socializing. The armrests move with the body throughout the range of full recline and rotational seat positions. Head Restraint — The AI17 features both a four-way powered and a manual head restraint. The front seat's wide, four-way powered head restraint supports the occupant's head in fully reclined and in rotated seat positions. The manual four-way head restraint incorporates a dual sided, easy-to-grasp handle that assists in properly adjusting the head restraint. Adient's exhibit in room 310B of Cobo Center will be open to media and invited guests Jan. 9-12, with a press conference held at 6:30 a.m. on Monday, Jan. 9. 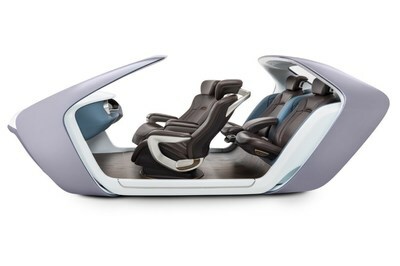 Adient, the world's largest global automotive seating supplier, today unveiled its innovative AI17 automated driving seating system to show how automated driving will impact the driver and passenger experience in a contemporary premium vehicle at the North American International Auto Show (NAIAS) in Detroit.